KIA has muscled up with an aggressive rear-wheel drive concept car. The Kia GT4 Stinger is focused on performance, boasting a 2+2 seating layout and grand tourer styling, which could indicate a bold new direction for the brand. Under the bonnet is a 2.0-litre turbocharged four-cylinder engine generating 235kW, partnered with a six-speed manual transmission. Wraps came off the Kia GT4 Stinger overnight at the North American International Auto Show in Detroit. It's an interesting move from Kia, which is building a strong presence in Australia. But does it have the linage to move from compact/mid-size cars and SUVs? 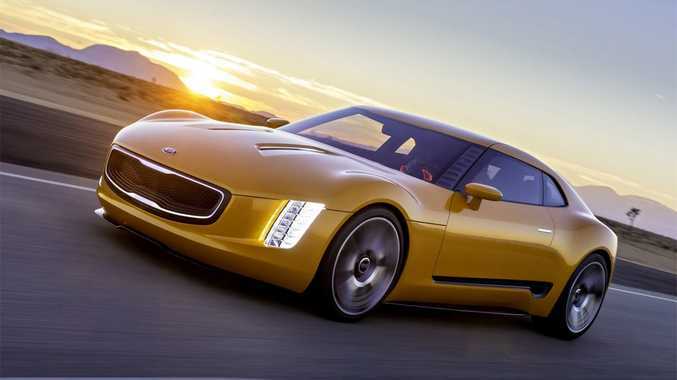 "If anyone were to ask if Kia has the credibility to build a car like the GT4 Stinger I would simply point out that Kia races - and wins - against some of the world's most legendary performance brands," said Kia Design Center America chief designer Tom Kearns. Custom 20-inch aluminum centre-lock wheels feature carbon fibre inserts for strength and weight reduction. Tucked inside the massive wheels are Brembo Gran Turismo two-piece 15-inch cross-drilled rotors and four-piston calipers. Underpinning the GT4 Stinger's "Ignition Yellow" body is a custom chassis with independent double wishbone suspension. With a shorter wheelbase (2618.7mm) and overall length (4310.4mm) than a Cerato sedan, a width (1889.8mm) greater than a Optima, and a swooping roofline nearly 225mm lower (1249.7) than a Rio hatch, the GT4 Stinger cuts a menacing figure. It tips the scales at a scant 1303.6kg, and weight distribution is spread at 52% front and 48% rear. There is no carpet, only a rubber floor mat underneath the billet-aluminium pedals. In keeping with the track theme and taking inspiration from sports and competition cars of the past, interior door handles have been replaced by red-stitched pull straps. And highlighting its track focus, the GT4 Stinger makes do without the luxury of a stereo. "The audio system starts under the hood and the speakers are the exhaust pipes," said Kearns. There are currently no plans to bring the concept to production. Although Kia has pointed a history of delivering production vehicles that bear a strong resemblance to the concept that preceded them.